41 Moorhead Mnr #41, Naples, FL.| MLS# 219008390 | Southwest Florida Residential Real Estate for Sale. 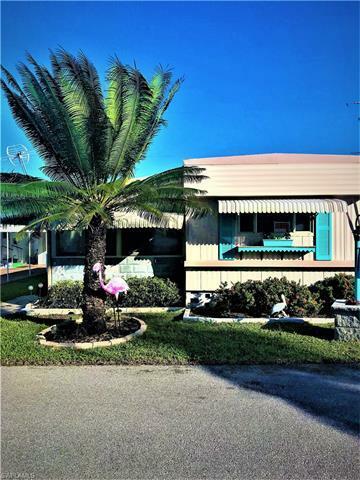 This beautiful, eye captivating 2 Bedroom mobile home IS PRICED TO SELL QUICKLY! This home has been decorated in a beach theme, & it displays an array of upgrades & features such as: A finished Florida room with a second dining area & a separate exterior entry door for privacy & convenience. The granite & marble installed in kitchen countertops, floors, steps & other areas gives the home a rich, luxurious feeling. The beautifully designed carport floor is made of stamped concrete. The bathroom has been upgraded with a top of the line enclosed shower door & marble tiles in walls. This 55+ community home, surrounded by the prestigious Windstar golf and country club community and the Botanical gardens, only 5 minutes away.The amenities include a clubhouse, a very large pool, shuffleboard and more. The attractive & extremely low HOA fees of only $170 p/m, & yearly taxes of only $615.96 makes it the most desirable, affordable place to live only 10 min away to downtown & the Naples beaches.This could be the perfect winter getaway or a year-round residence for you. Donât miss the opportunity to purchase it while is still available because it wonât be on the market for long!